All good parenting begins with a fear of the Lord. Fathers set the tone for their household. Make sure your God is at the center of your family. The chief job of a father is to teach his kids biblical wisdom at all times. Always remember that children are a blessing from God. Find your parenting strength in God. Talk to your kids about the Bible and help them to learn scripture. Use scripture as the basis for your parenting. God works through fathers to impact their children and families. How is he working through you? Teach your children wisdom and they will bring you joy. Teach your children to lead their live based on a biblical worldview. The way you lead your life can be a blessing to your kids. Lead a godly life. Remember that your choices and actions will impact your kids and their kids and their kids. A good father disciplines his son out of love and with love. Do not provoke your children. Parenting is a temporary stewardship. Marriage is forever. The best thing you can do for your kids is to be a good husband. God cares about the relationship between fathers and their kids. 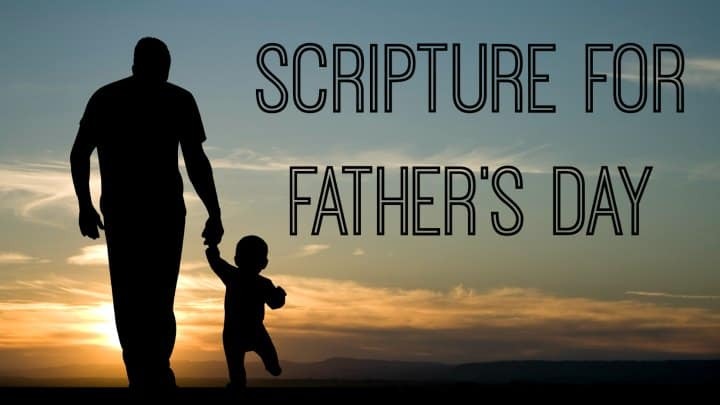 We hope you’ve enjoyed these father’s day scriptures, don’t miss all our father’s day ideas for church. Tony Kummer (Editor) reviewed & updated this page on : June 23, 2017 at 10:10 pm. All our content is peer reviewed by our readers, simply leave a comment on any post suggest an update.